It’s sad to admit, but I rarely hike unless I’m on vacation somewhere spectacular. The hiking in my area isn’t at all scenic and many of the trails here (Mammoth Cave, Kentucky) have been devastated by horses. There are some decent trails in the Eastern half of the state, but that’s a good four hour drive away, and as compared to the Mountain West and/or west coastal hiking areas, still not very scenic. Therefore, when I get a chance for a good hike, I take it. One of my opportunities came on a trip to Oregon to see my transplanted friends, the Campbell’s. 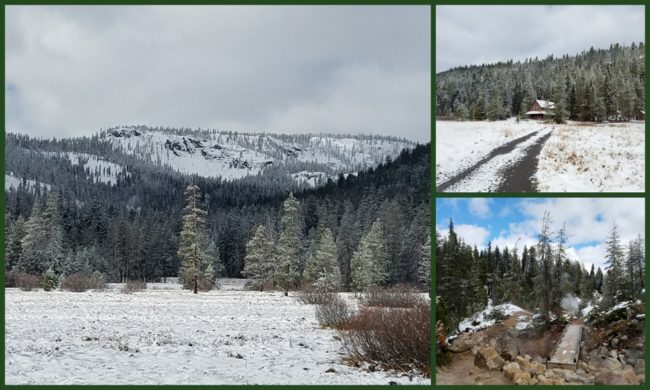 Jeff and I had been bouncing around the idea of heading down into northern California to check out the Lassen Volcanic National Park, even though it was way late in the season, early November. The park, located near the town of Chester touts over 106,000 acres of mountainous terrain with a variety of trails and geologic features. 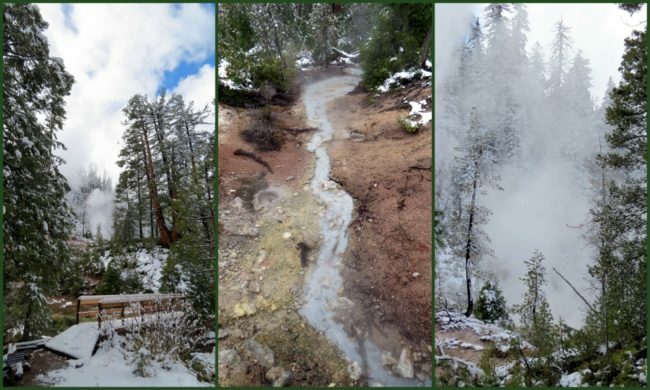 It is one of the very few areas anywhere in the world that is home to all four types of volcanoes: cinder cone, plug dome, shield and strato. Before my arrival we’d picked out a number of hikes to take, but the weather shut all but one down, the Devil’s Kitchen area. 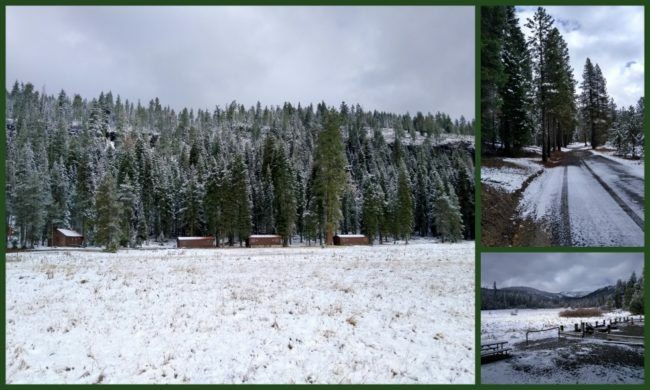 It was a cold, breezy and snowy morning when we arrived at the Warner Valley trailhead. One nice thing about this trail is that it is a combination of regular surface as well as boardwalks and bridges over the especially wet areas. 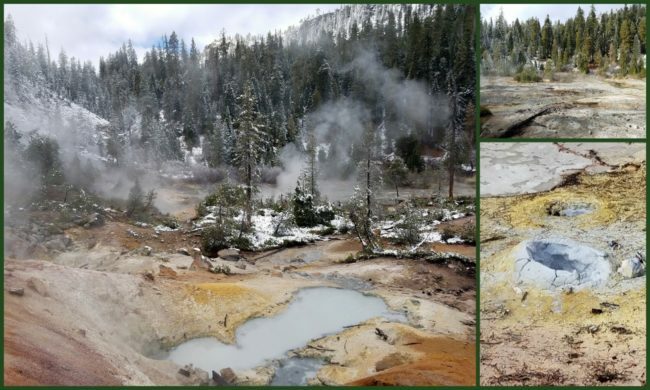 It takes you through two beautiful meadows before the hydrothermal area, where many plant species cannot exist. 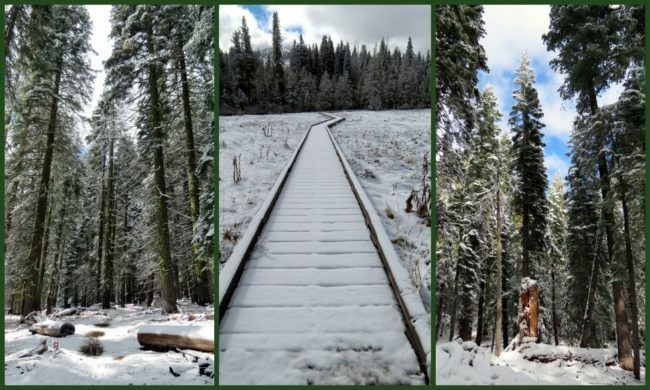 Our 4.2 mile hike started in snow and by the time we got back, much of it had melted off. One thing that makes this a particularly interesting hike to a native Kentuckian are the scale of the trees along the tail, vastly bigger than anything in the Bluegrass. 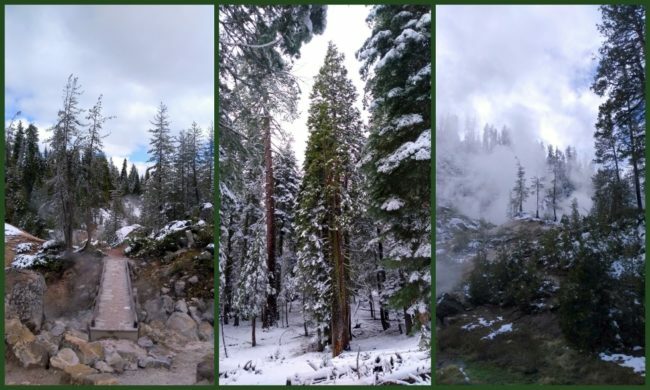 There are three primary Plant Life Zones, Mixed Conifer (below 6,500 feet), Red Fir Forest (6,500 to 8,500 feet) and Sub-Alpine (8,500 to 10,000 feet). All these elevations are above sea level in case you didn’t know, just saying. 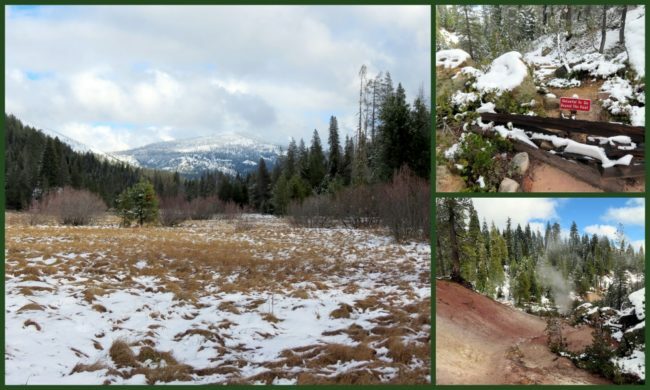 In the Mixed Conifer zone you’ll find Ponderosa and Jeffrey pines, white pines, white fir as well as an assortment of near-the-ground plants and wildflowers. In the Red Fir Forest you’ll see red fir, mountain hemlock, white pine and lodgepole pine. At the Sub-Alpine elevations there are few trees, but you will find; lupine, Indian paintbrush, and other ground-hugging vegetation. We never hiked above the tree line but very much enjoyed the massive trees and diverse vegetation along the way, made for a beautiful winter hike. I’d love to report that we saw an abundance of wildlife, but that was simply not the case. The park is home to tons of species but they were pretty well dug in for the winter it appeared. Lassen is home to the bald eagle though, which is a big deal as it’s listed as threatened under the Endangered Species Act. After our easy, slightly uphill trek (5,650 to 6,080 feet) we found ourselves at the Devil’s Kitchen area. 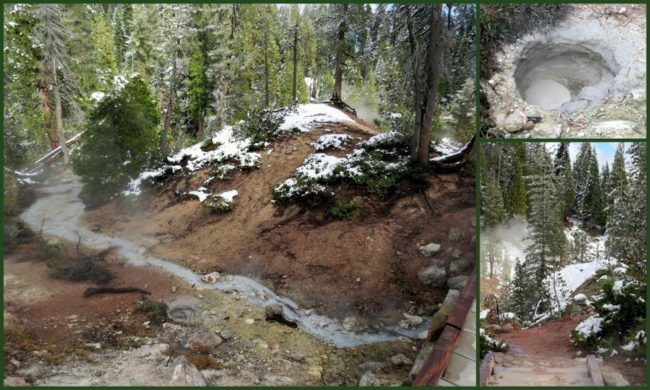 You could smell the sulfur way down on the trail and could hear it once you got fairly close. We crossed a footbridge and were right in the middle of the features. There were mud pots, fumaroles, boiling springs and stream coming out of countless vents. 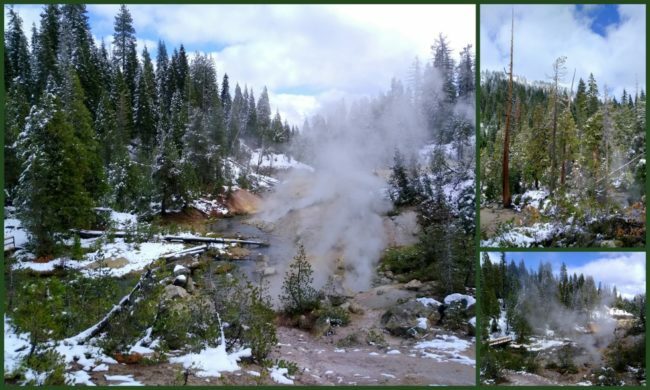 It was very Yellowstone in nature, which was great for me as I’d never been there. The ground was unbelievably sticky and slippery. Jeff, who is apparently about half mountain goat had no trouble going up and up, but for me it was a bit of a challenge to get over some of the obstacles, which I did but at a slower pace. We stayed in the Kitchen for about an hour, photographing and filming anything and everything we saw. One interesting note was that almost all of the plant life nearby by yellowish in color. I don’t know if it was the sulfur actually staining the plants, or their reaction to the gasses in the area. I think probably the latter, making the plants somewhat sickly. We finally started our descent back into the lower valleys and headed back to the Tahoe for our trip out. Most of the snow had melted while we were up looking around. If you ever get a chance to visit the park, do so. 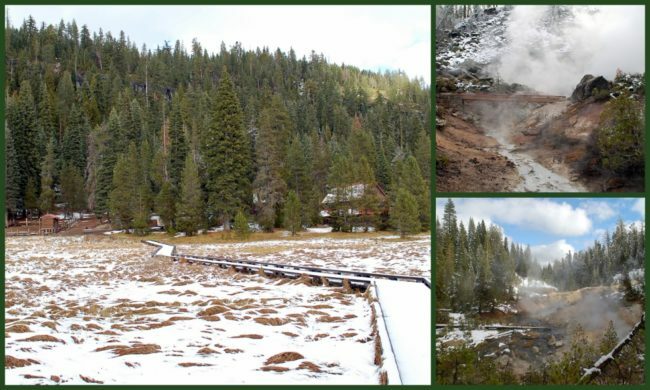 It’s in a beautiful area, has tons of stuff to see and do and even the tiny town of Chester offers many great places to eat out, only minutes away from Lassen Volcanic National Park. I would suggest however that you do it before November. I’m thinking September to early October would be optimal. Last modified on: December 22nd 2017.